Sammy was a mistake and an accident. I have never shared the complete story of Sammy to anyone, people knows bits and pieces of his story but not the entire tale. I think now is a good time to share the story that came to be known as Sammy as this is a way to help me remember him and the memories we shared together. I imagine as time goes by it will be harder and harder to remember Sammy as if it was yesterday. I do not know why God wanted Sammy back so soon, I am grateful for the time I had with him and for what he did for me. Sammy was my dog for 12 and a half years. His story begins with Leah, my other dog and Sammy’s mom. Leah is a Siberian Husky, gorgeous blue eyes, black and white fur. Striking balance of wolf and dog, pretty as they come. I have always had a fondness for huskies and how wolf-like they are. This probably stem from as a kid my family had a friend who owned a number of huskies, most of them were male, very stocky and pretty. The year was 1999, I was working at the Lotus Development division of IBM, attending the University of Georgia in Athens and dating this girl named Katie. We had been dating for a little over two years and the opportunity to move to Atlanta came up. Prior to that I was commuting back and forth between Atlanta and Athens for work and classes. And since I was working five days a week and just a couple of days for classes it made sense at the time to live in Atlanta rather than Athens. So we moved to Atlanta and she surprised me with a husky puppy one Friday night. She knew I liked Siberian Huskies and since we were in a house with a yard, she thought it would be fun to get a puppy. This puppy we named Lindsey. About a month went by and we thought Lindsey should have a playmate while we were at work or school. And this is how Leah came into my life. The relationship quickly went bad and we took some time apart. Katie took Lindsey and I got Leah. One day near the end of summer in 2000 she asked if she can take Leah to the park and I thought sure, where is the harm in that. This was one of only a handful of times when Leah was not with me. A day in the park turned into about a month of Leah being away from me. Not having Leah with me was terrible, the therapist I was talking to suggested I adopt a retired greyhound. I told him no, I wanted my Leah back and I don’t like other breeds. 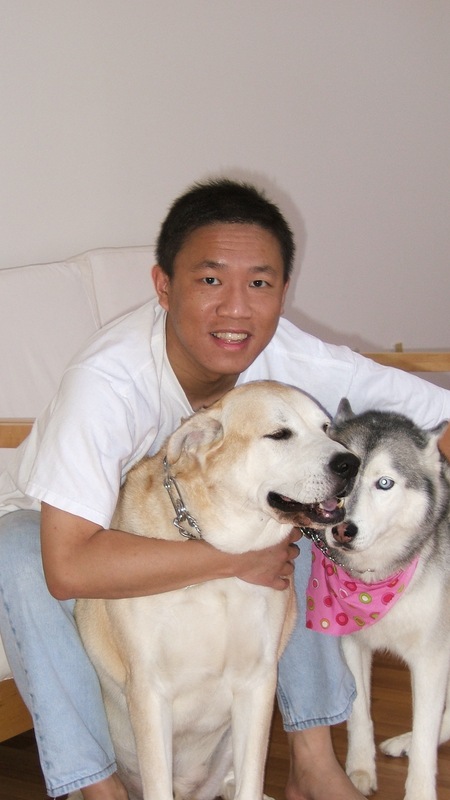 I like huskies and he soon became my former therapist, not just because of the dog thing. When Leah was brought back to me, she looked fine and nothing was said about their park experience. About 5 or 6 weeks went by and I noticed Leah was getting fatter. During a visit with Katie I asked if she thought Leah was getting fatter too and that’s when she informed me Leah may be pregnant. Leah got away from her during the park visit and apparently met up with another dog. To this day I have doubts about the authenticity of the event but it makes for a pretty funny pregnancy story. Katie has always been careless with dogs and I think Leah got out from the yard at the house she was staying at. The vet thought we were going to have Christmas puppies and estimated the due date to be around Dec 24 to 26. The day was December 11, 2000. I had decided to quit my job at IBM and return to school full-time in order to get my degree faster. The job wasn’t what it used to be and I was no longer enjoying the work while also having to deal with a relationship going bad. I was 13 course credits away from graduation and knew I can get through classes in just a couple of semesters. The morning of, with a resignation letter in hand I headed to the office. Before I left, I noticed Leah had decided to spend the night in my bedroom closet on a pile of clothes and towels. It was December and I figure she enjoyed the warmth of the clothes and thought nothing of it. I told her I would take her for a walk when I got back, the vet suggests taking walks as it helps induce labor in dogs. After saying a few goodbyes to coworkers I was on my way home and decided to stop by a chinese take-out place that was a frequent lunch time restaurant of choice among coworkers and I. I ordered this special the owner made for me because my coworker and I ordered it so much. It become known as the ‘IBM Special’ and you have to order it in pairs because it is Hot Braised Chicken lunch special and Hot Sautéed Chicken lunch special. The lunch special is basically the dish, fried rice, and egg roll. These two dishes were my favorite and I always had a tough time deciding which one I wanted until one day, as a joke they asked if we wanted to order this and they will split the dish between the two lunch specials so you get best of both dishes. With the chinese take-out I was on my way home to celebrate the decision to return back to UGA and quickly get my degree. It was a little after 12pm and I came home to find Leah in labor. She had already given birth to a baby and was in between the next. Having never experienced child birth of any kind, human or canine I was a little panicky due to not knowing what to do. I have read up on the information brochure the vet gave and it said the mother will do all the work, I just have to watch if she was in trouble or needed a little bit of extra help getting the sack open. I called a good friend of mine who had seen his cat deliver a litter before and got a few pointers on what to do. It was incredible watching the little babies enter this world and Leah’s mother instinct kick in and lick open the sack and bring life into the puppies. In all, Leah had 8 puppies but one did not make it through the process. 4 boys and 3 girls. Only one had pointed ears like Leah and there was only one dog with blue eye (one blue and one brown). None of them look alike and did not have much husky features. I don’t remember the exact number Sammy was but I think it was either 3 or 4. The whole event took about 5 hours with a hour or so of break. After 5 babies I thought Leah was done because she rested and I went to take a nap. I woke up to her back in labor and Dr. Phil on the television. There is a saying that God will give you what you need at the moment you need it and not a moment sooner. I believe this whole heartily even though sometimes I want things to happen sooner or what I think I need. At the time I really don’t know how I was going to take care of 7 little puppies and Leah. Leah was 1 year and 1 month old, I was unemployed, no income, piles of debt, in the middle of a bad relationship. My parents helped me out big time and between their help and student loans I managed to get back to classes and take care of the dogs. I think the dogs were a big help to me. I was busy back in classes and taking care of them, this did not leave much time to ponder over why things were happening or being depressed about the failing relationship. It was also interesting with the little puppies around. They were so much fun to watch and play with. I have this memory of taking Leah and the litter to the Sandy Creek Park in Athens. This park has a few fenced areas that allowed dogs and one day I packed the litter in my 3-door Saturn and off we went. It was fun and so good to see puppies run around. Puppies are so much fun but also a lot of work. It was also educational to watch Leah being a mom and how she will help clean up after the dogs. Originally I thought about breeding Leah so I can continue her bloodline. This was the reason she wasn’t spayed at the time, I sort of wanted one litter of huskies. Leah was spayed when it was safe to do so after the birth of her litter. At the time I had eyes for only Siberian Huskies, any other dog breeds wasn’t cute to me. Sammy changes this for me. I called Sammy my husky mutt and I loved him. He was smart, fun, and a teddy bear. His coat was soft and smooth like a teddy bear and would sit still for bear hugs. Sammy was not the dog I was going to keep. I had decided I would keep one dog from the litter and find homes for the other brothers and sisters. The dog I picked out was the last puppy from the litter, the smallest and the one with the pointed ears. It was also female, I thought a female would go better with Leah although I did consider one of the sons. I called her Little Pup but her name was Fiona. Weeks went by and between Katie and I we found homes for everybody except Sammy. She couldn’t find homes for Sammy and brought him back for me to try. It came down to two dogs and one couple looking to adopt. 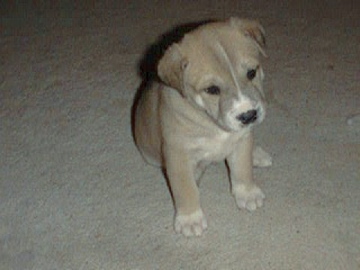 They picked Little Pup, I think it was because she was smaller and cute as a button as the saying goes. Sammy was a little chubby, he likes to eat and with 7 brothers and sisters he was always fighting to eat during feeding time. One regret I have with Sammy is I never let him be a dog. Like a first time parent I was very protective and still learning how to be a dog parent. It took me a while before I would take Leah and Sammy along for errands or be in the car. I didn’t take him and Leah on car rides often or go to dog parks. Mostly due to me being in a hermit mind set at the time. I didn’t want to go anywhere or be around anybody. It was mostly school then home. Didn’t want to deal with the outside world but wanted to see Leah and Sammy. It wasn’t until a good 5 years later I started taking them everywhere. On Sept 11, 2001 I was glued to the tv and I remember that night I held Leah and Sammy close to me as we tried to understand the events of the day and the news coverage. The year is now 2002 and I finally have my bachelor of science degree from the University of Georgia. I was a college graduate. 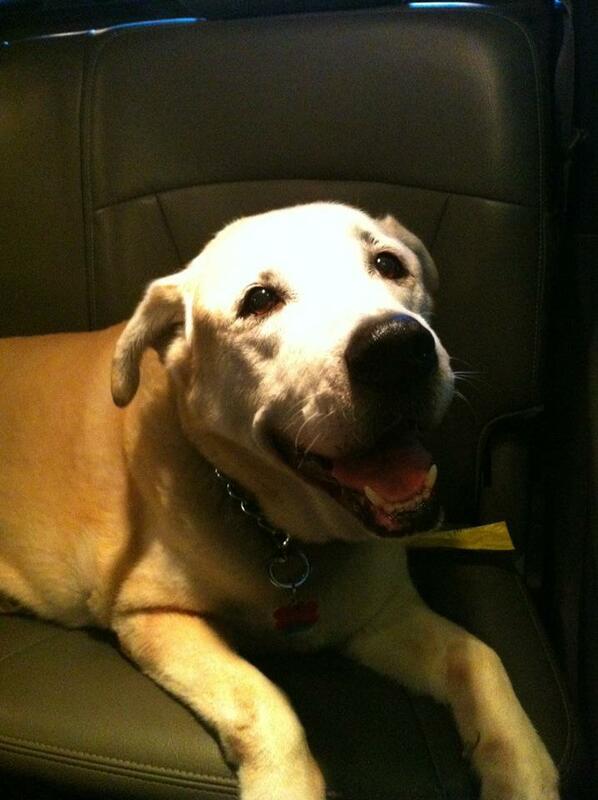 One of my favorite memories with Sammy is him riding in the car with me. He was in the back seat, window half down, he had his head out the window and the wind was causing his ear and lips to flap. It was the funniest thing and he looked so happy. Sammy had big flappy ears and lips, I love to grab his face and shake to cause the lips to flap and make flapping noises. I couldn’t tell if he liked it or not but I sure enjoyed doing it. During Sammy’s time with me there has only been a handful of times when I was not with him. Late August of 2003 was one of those times. Katie was over at my place while I was at work. The relationship wasn’t officially over although in hindsight it should have been over for years. I get this call saying Leah and Sammy had escaped from the yard and she couldn’t find them. She tried to look for them but don’t know where they are. For three days I tried looking and had no luck locating Leah or Sammy. I couldn’t go to animal control the next day because this was Dekalb County and at the time between work and hours when the are open I had difficulty getting there. When I finally made it there I went cage by cage looking. Almost to the end and no Sammy, when I see this yellow lab looking dog that looks like Sammy but I wasn’t sure. This was probably the first time I had seen Sammy bark at another dog but this dog who I thought was Sammy was by the cage door and another dog was beside him. Sammy snapped at the other dog as I was double and triple checking. I was looking at Sammy’s nose where he has this pink mark. I was almost certain it was Sammy and got him out and home. He would be microchiped shortly afterwards. For the next 8 years I wondered on and off if I had gotten the right dog. During Christmas of 2011 I decided to test Sammy’s DNA to find out what breed he is. The test result came back indicating Sammy was 50% husky. I was so relieved because this meant I got the right dog. Leah is pure breed AKC registered husky and Sammy’s lineage on the mother’s side showed pure Siberian Husky going back generations. Leah and Sammy helped me through the relationship. They gave me their unconditional love and support. I enjoyed coming home and seeing how excited they got to see me. I gave them McDonald french fries and treats. 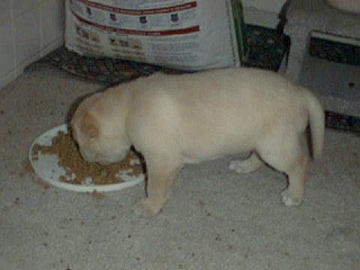 Maybe gave Sammy one too many, he got a little bit fat but he was my Sammy and to me, he wasn’t fat at all. I remember this one time during 2006 where this lady came up to me and had the nerve to tell me she thought Sammy was fat and that I should do something about it. I simply said thank you and nothing else but I wanted to say so much more because for one thing, she was very fat herself so what right did she have to tell me about my dog being fat. That and her dog was very ugly. Like I said, I am very protective about Leah and Sammy. I am lucky for Leah and Sammy turned out to be great dogs. I wasn’t always good to them. They were happy to see me and were so good about being house trained and not tear through anything. I don’t know what they did while I was away but maybe they had a nice time playing poker. I wish I had taken them on more walks each day but some of the good memories were us walking in the darkness of the night, hearing how calm and refreshing the night air was. There was something about the night air and how calm and quiet it was. It was nice just knowing it is unlikely people would see us or I would run into anybody. Leah, Sammy, and I would walk around the neighborhood just feeling the calm air and thinking I was Batman. 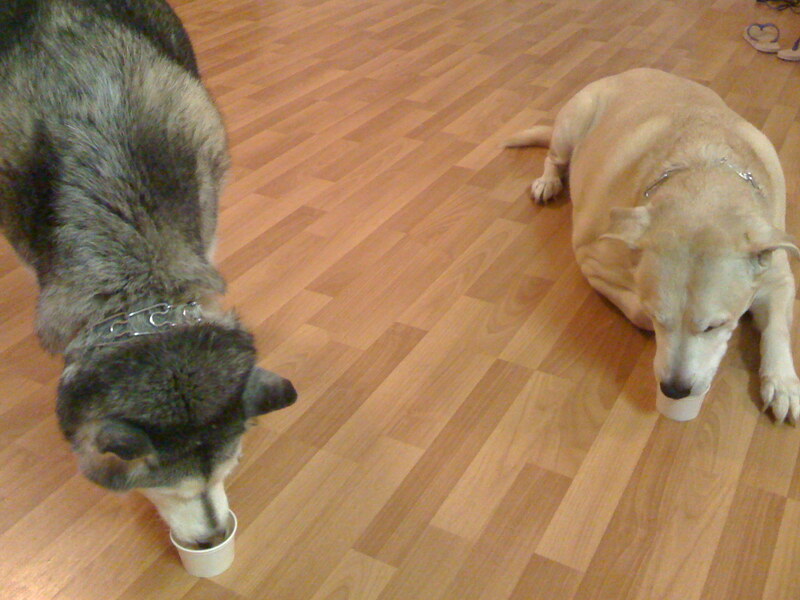 In 2004, a coworker gave me two doggie ice cream she saw at Wal-Mart and life would never be the same. Watching Leah and Sammy eat ice cream became a highlight of our time together. It is so funny watching them lick the cup on wood flooring. The cup would slide and they would follow, lick and slide, lick and slide, and repeat. They enjoyed the ice cream and I enjoyed watching them eat it. Doggie Ice Cream became a common treat to this day and I am glad Sammy got to enjoy it one last time during his last week with me. Although I regret not giving it to him again during our last night together but he had stopped eating and had no interest to any treats I put in front of him, I worried if it would make him sicker. In hindsight what did I have to lose and I wish I had given him a doggie ice cream one more time. Leah and Sammy got along great, maybe it was the mother and son bond. Sammy definitely enjoyed being the center of attention. 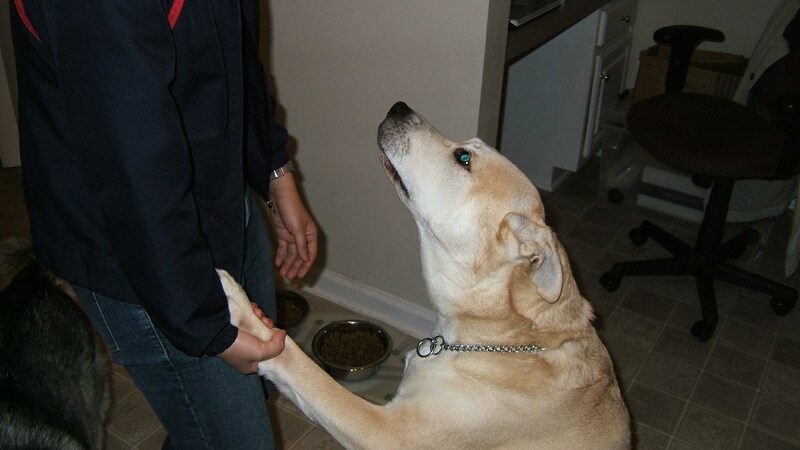 When I would pet Leah, Sammy would try to get his head into the action and would try to move my hand to his head to pet him. He may have also shown signs of being protective towards Leah. 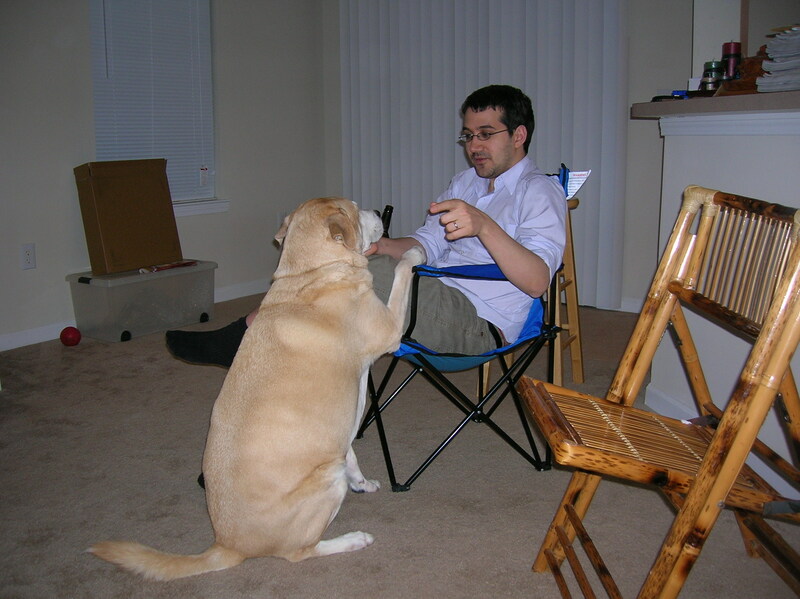 In 2005, in preparation for a trip to see my parents I took Leah and Sammy to a dog boarding place to be evaluated. They separated the dogs and let Leah play with other dogs while Sammy was nearby in a kennel. I wasn’t there but from what I was told, Sammy tried to crawl through the fence and was showing too much excitement being away from Leah. I don’t think Sammy was showing teeth but he didn’t like being separated from his mom. Sammy didn’t know a lot of tricks but he knew three. One was how to shake your hands, he also knew to use the same paw that was on the same side as the hand you have put out. So for example if I extended my right hand to shake his paw, he would take out his left paw. The second trick he knew was to pick which hand I was hiding treats. Sometimes when I gave him treats I would hide it in the palm of one hand which I had behind my back so he didn’t see which hand I was holding the treat. I would put out both hands and he would sniff each and tap on the hand I had the treat with his paw. He didn’t get it right all the time but if he picked the wrong hand he would tap on the other when he sees I didn’t open it. When he tapped the right hand I would open my palm and give him the treat. Another was I can put a biscuit on the tip of his nose and ask him to wait and not move his head until I said ‘ok’. 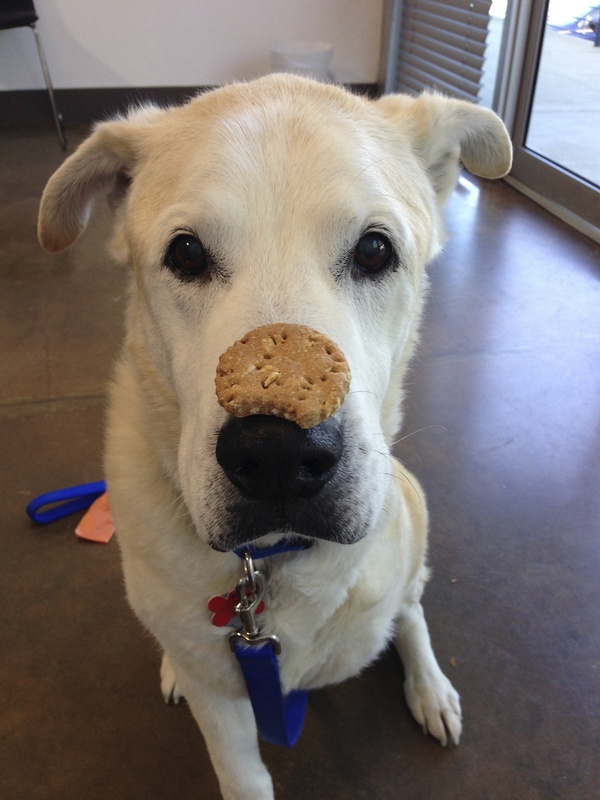 He would wait patiently and when I said ‘ok’ he would flip the biscuit into the air and catch it in his mouth. Part of the reason why I don’t take vacation is because if I can’t enjoy it with the dogs it wouldn’t be fun for me and I rather not be on vacation. In a number of ways it is self punishment. Leah and Sammy have done so much for me during the dark years of my life and if I am in paradise enjoying it I want them there as well. I have this vision in my head of me swimming with Leah and Sammy in our own swimming pool or going for walks on the beach or going on a road trip to Grand Canyon and having a picture taken with the canyon as the backdrop. Sammy and I will never get to live out this vision, it is another thing I will regret. I try very hard not to have regrets in life as I already have plenty but with Sammy I have more than I can bear. I am trying not to make the same mistakes with Leah and Buddy. I am taking them to doggie daycare and letting them be more like dogs. Letting them socialize with other dogs and I am looking for places where I can take them. 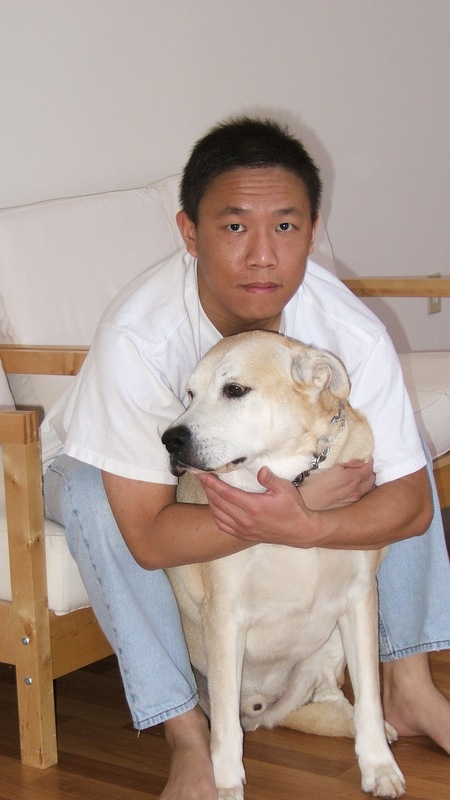 From 2002 to about 2006 I took Leah and Sammy to those low-cost vaccination clicnics on Sundays at various PetCo across Atlanta, GA. At the time I wasn’t making a lot of money working for a small software company and this was a way to keep the cost down with two dogs. People always commented at how well behaved they were in the store. I had them sitting beside me and wouldn’t let them get distracted by all the other dogs around us. This was both good and bad. I should have let them socialize a little bit more but I also didn’t want them to misbehave and get into fights with other dogs. Sammy definitely wanted the attention when people would pet Leah. It was fun telling people they are mother and son. 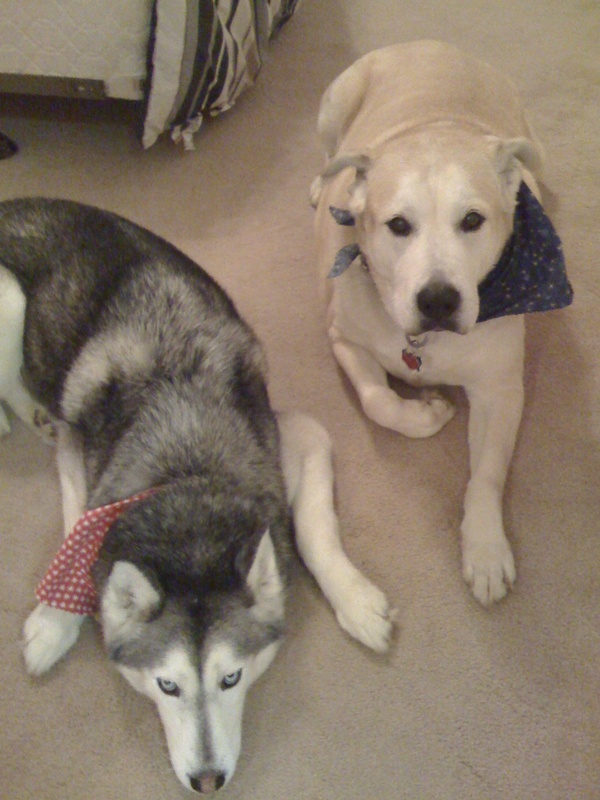 Nobody believes me when I tell them this because Sammy was a much bigger dog than Leah and didn’t have a lot of husky features. I can’t believe it either and I was there during birth. Sammy wasn’t always afraid of rain or thunderstorms. An event in August of 2005 changed this. August 16, 2005 to be exact. People often say there is a defining moment when they grow closer to God. This may be that moment for me or at least the start of the moment. I could have lost them both on this day. 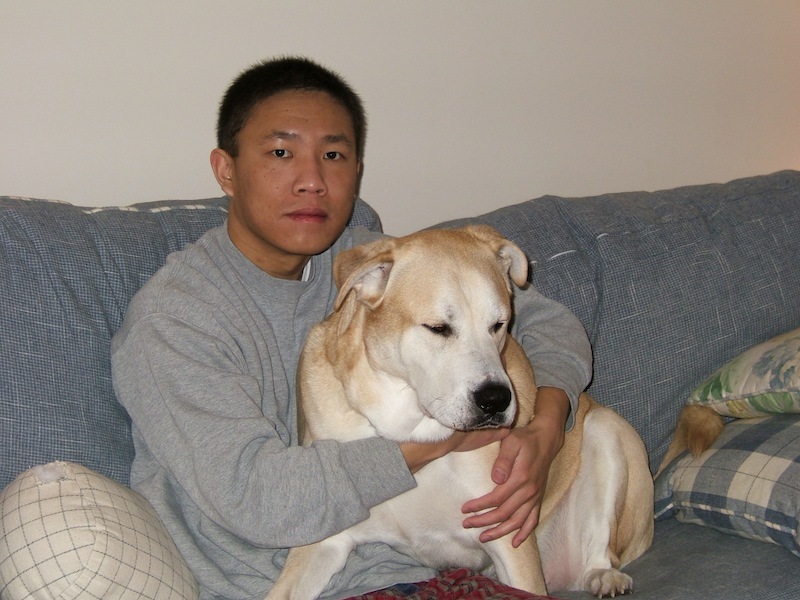 I lost Snoopy, another dog I was caring for, not directly but what happened as a result of it. This has haunted me to this day and is one reason I would go out of my way to care for a dog regardless if it was mine or not. This was the day the house I was living in got hit by lightning and caught on fire. It rained that afternoon and I was on my way home from work. The rain had stopped and my car windows were down. I was driving through this neighborhood like I always do to avoid traffic and as I got closer I smelled burnt wood. The thought on my mind was oh no, I hope someone’s house didn’t get caught on fire. It was August and fairly warm so I didn’t think people would be using their fireplace. As I turned into my subdivision and started to make the left turn to my street I see 5 fire engines and 3 ambulances. I see firemen walking all over my front lawn, this wasn’t a shocker as there is a fire hydrant in my yard and I knew they would need to use it. Since my street was blocked I parked down the street and started to walk up to my house. I stopped a fireman and asked what was going on. He said one of the house got hit by lightning and caught on fire. I asked him which one and he said the one with the green front door. I said, that’s my house. I told him I had three dogs in there and asked what happened to them. He told me a neighbor had them in her house. Some day I may tell the story of the fire or Snoopy. I am very thankful for the two neighbors who risked their safety to ensure my dogs were safe although a little drama took place with Leah being the smart escape artist that she is. That night Leah and Sammy stayed with friends and I got to see how great Leah and Sammy were with people they hadn’t met before. The insurance company was great and found me places to stay that allowed dogs. First it was a hotel then it was an apartment complex that had a dog policy with weight limits but luckily they waved it for me because the apartment was on the first floor. Hotel living was fun and not too bad when your dogs don’t really bark at every noise in the hallway or door knocks. The only bad part was I was on the top floor and each bathroom break meant walking 5 flights of stairs. I dreaded running into people but when I did they all commented on how pretty my dogs were. For the next two years we were in an apartment that was near the back of the complex and was in a courtyard with a decent size yard. Sammy was my teddy bear. He was great on the couch or bed and allowed me to hug him unlike his mother. When we were on the couch he would sometimes rest his head on my leg or lap and would let me pet him or squeeze his belly. The thing I most enjoyed doing was playing with his lips, Sammy had big lips that I would grab and shake his face causing them to flop wildly. I don’t do this for long and he didn’t seem to mind me doing it. 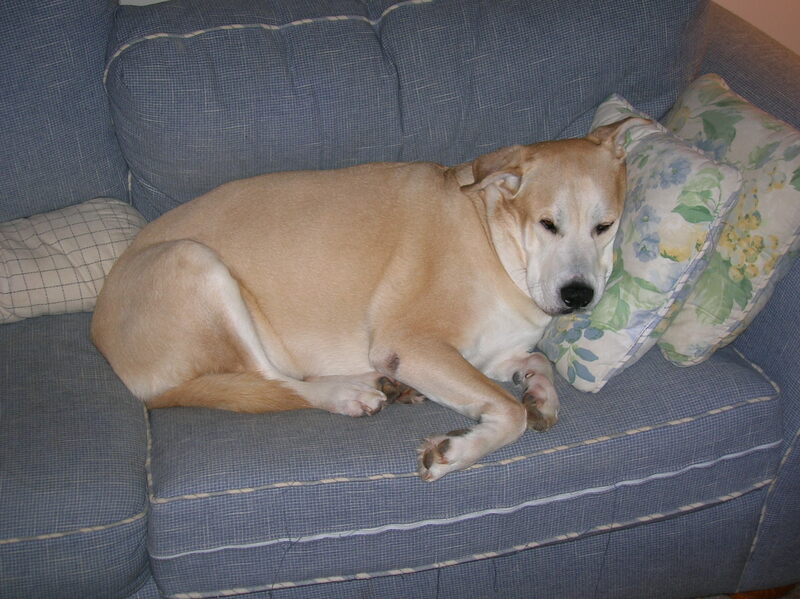 Sammy was a couch hog, he enjoyed getting on the couch and getting comfortable. I suppose he knew it was not going to be easy to pick him up and move him and often didn’t leave me with much space. From 2003 to 2006 I was driving a Ford Escape but after the fire I wanted my dogs in the car with me and be able to stick their head out. Sure they can do it from the back seats but I wanted a car with a rear power window that I can control. Most SUVs had rear windows that opens upwards but not down and these were manual so I couldn’t close the window while driving. At the time the only car I knew had this power rear window was a Toyota 4Runner and I have always wanted one. Well, not always but I wanted one because a silver metallic 4Runner was the dream car for a girl I knew years earlier. As I started shopping around a coworker found a GMC Envoy that also had this feature. Luckily the price of gas at the time was high and people didn’t wanted SUVs so I was able to buy this amazing car with so many features at a very good price. The best thing about this car was there is a mid-gate window (like a limo) between the back seat and the trunk area. I could put Leah and Sammy in the trunk area and slide up the mid-gate window. We went on many car rides like this. For many years I didn’t want to dirty up the inside of the car and this was the perfect solution. The trunk area was also water tight so I can roll up the windows and hose it down to clean. It wasn’t until 3 to 4 years later that I started letting them in the passenger or back seat. I wish I had let them in the car earlier. While we were living in the apartment we were also near a park. There was this one time I wasn’t thinking and took them to the park for a walk. I say I wasn’t thinking because I did this in the middle of the day when it was hot and the pavement was also hot. Sammy burnt this paws and I am forever sorry for the pain I caused Sammy. For days he was limping when he walked. I felt so bad, I got too excited about having the day off and we were going to the park that I didn’t think about the time of the day and how hot it would be on the ground. Should have bought them shoes. The beauty with dogs and Sammy is that even though he was in pain he never complained or stayed mad at me. He was happy just being with me. Sammy likes to sleep next to me, in the beginning he preferred to be by my legs where he can put his head on a leg but later in his life he liked to rest his head on my chest or shoulder. When he rested his head on my shoulder I would rub his nose and hear his breathing slow down. Sammy had a different breathing if I was doing something he liked such as rubbing the bridge of his nose or rubbing the back of his ear. There were many a nights when I would put my ear to his nose and hear him breath as he felt asleep. In the summer of 2007, Leah, Sammy, and I moved back to the house after the repairs were finished and after a few unsuccessful attempts at selling. Before the fire the dogs were in crates while I was at work but this time I decided to let them have open access as they were older and less likely to make a mess and besides, they were great during our apartment stays and didn’t destroy any furnitures and pretty much kept to themselves. One morning around 9am I get a phone call at work from a neighbor informing me she has Leah and Sammy. Needless to say I was surprised and rush home to see how they got out. I came home to find a panel on a window at the front of the house has been broken and somehow the dogs managed to squeeze through. It is a miracle Sammy didn’t cut himself as he was a little bit wider than the panel and I am still not sure how he got out. The theory is either someone was trying to break in and the dogs surprised the individual and tried to get after the person or they saw a rabbit in my front yard or a neighbor’s small dog is on the yard and they wanted to say ‘Hi’. 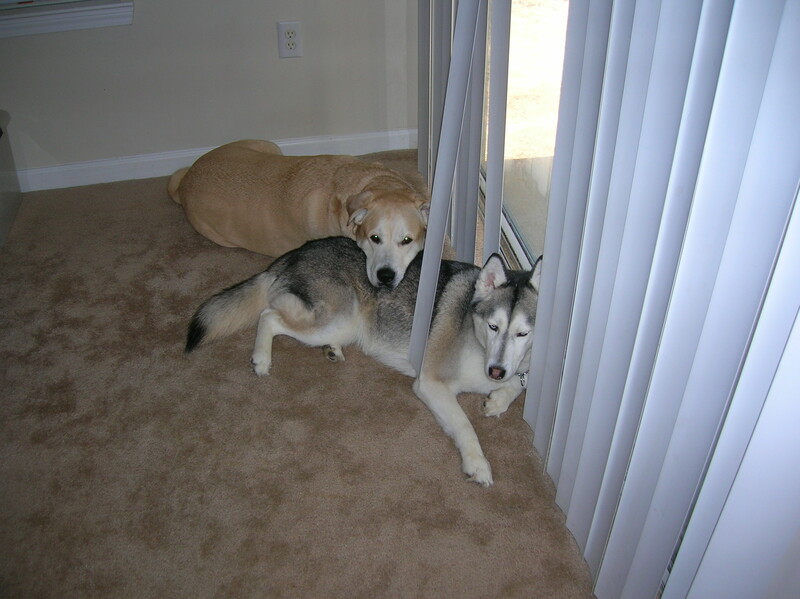 After this incident the dogs were back in a crate while I am at work and came the desire to spend more time with them. I also had a security system reinstalled. For the new few years (2008 to 2009) it was pretty quiet. Sammy was never really a dog that wanted to fetch and neither was Leah. When I throw a ball past Sammy he would turn his head to watch it roll past him and then turn to look at me as if to question, ‘and what would you like me to do with it’? A game of fetch quickly turns to me throwing, me retrieving the ball, and Sammy watching me do both. 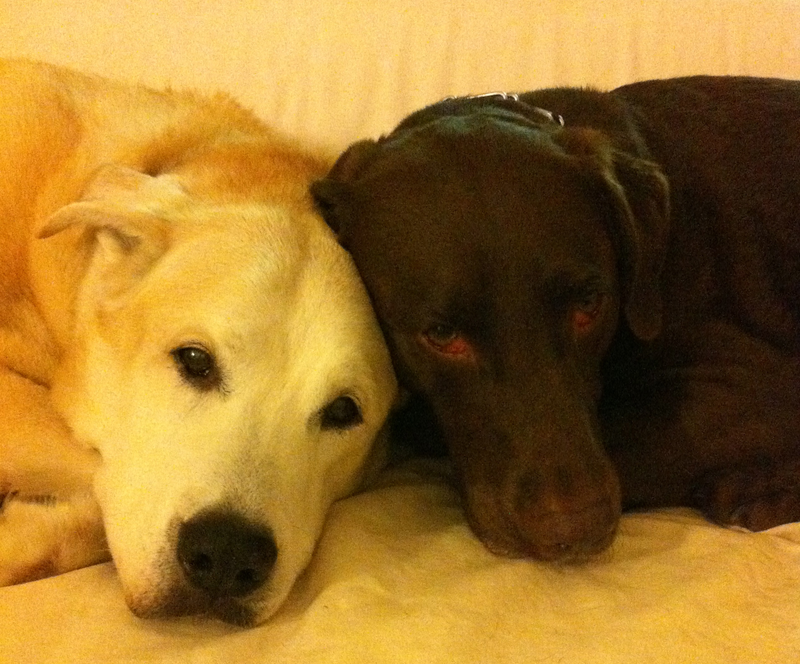 As the dogs and I grew older so does the desire to spend more time with them. They were excited to see me when I returned home from work. 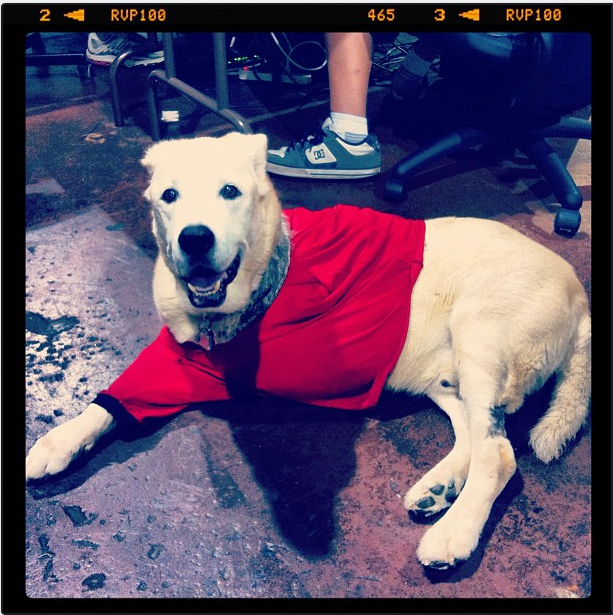 In 2011 I was changing employers and had the opportunity to work for a employer who encouraged dogs in the workplace. For one, we were working out of a residential loft where half was office and half was the boss’s home and he had two dogs. It took me a good six months before I brought Leah and Sammy to the office. There was no good reason for why I waited so long except I was stupid. I was worried how Sammy would take to the other dogs and wasn’t sure how I would adjust to having to worry about Sammy and Leah trying to escape. Others in the office weren’t as careful when opening doors. It was nice going on coding breaks with the two office dogs and it was a good thing to take frequent breaks and not sit all day. It was fun playing with dogs to rest or think through a problem. One of my favorite photos of Sammy, he loved sitting in the back seat of my car and taking up the entire section, leaving very little room for Leah. 2011 to 2013 would be rough years for Sammy. He for the most part was healthy and did not have health issues except when he was a baby. When he was growing up he had overgrown eyelashes causing him to tear up whenever he would blink. When Sammy was neutered the vet corrected his eyelashes and since he was 1 no other health issues. Around age 10-11 Sammy started developing cataracts in his eyes, they were not severe but you can tell it was going to be a problem later in his life. Arthritis also became a problem but you couldn’t tell seeing from how Sammy jumped up into the SUV when we would go for a drive or the way he would run towards me when I have treats in my hand. During the Christmas shopping season of 2011 I was in a pet boutique shop buying treats for my dogs and the owner of the shop had a canvas painting of his husky on the wall. I thought it was nice and thought about getting one done for Sammy and Leah. 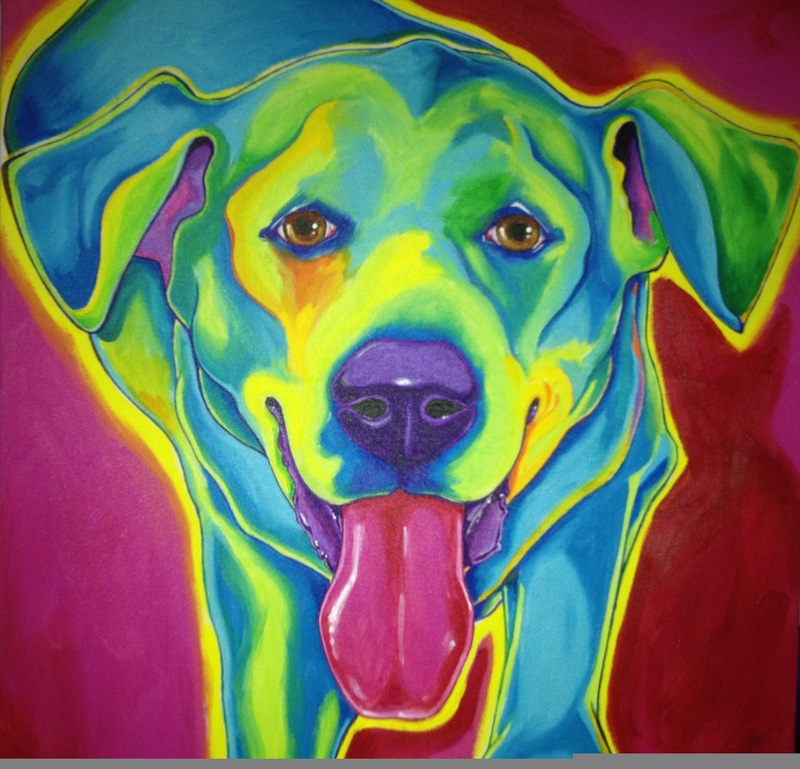 Thanks for the job during 2011 I met a gentlemen who did the type of pet painting I wanted and in the second half of 2012 I reached out to see if I would commission him to do two paintings for me. He had the time and got the paintings down for me in time for Christmas. It was the best present I would ever give to myself and it turned out better than I imagined. The painting captured Sammy’s smile and beauty. Near the end of 2010 a bump showed up on Sammy’s back near his right shoulder, at first I thought it was an infection because there was fluid buildup, every few weeks I would stick a needle to drain it. The fluid buildup kept returning so at his regular annual examination I asked the vet what our options were and it was decided to remove it via laser surgery and do a biopsy to determine if it was cancerous. There was also another bump on his body that was raising concerns for the vet and myself. It was on his left rear leg, very close to the bone. The mass by the shoulder was benign but the mass by his leg was malignant. 2011 would prove to be an even tougher year for Sammy. Sammy and his battle wounds after his first fight with cancer. The x-ray showing the fracture and cancer. 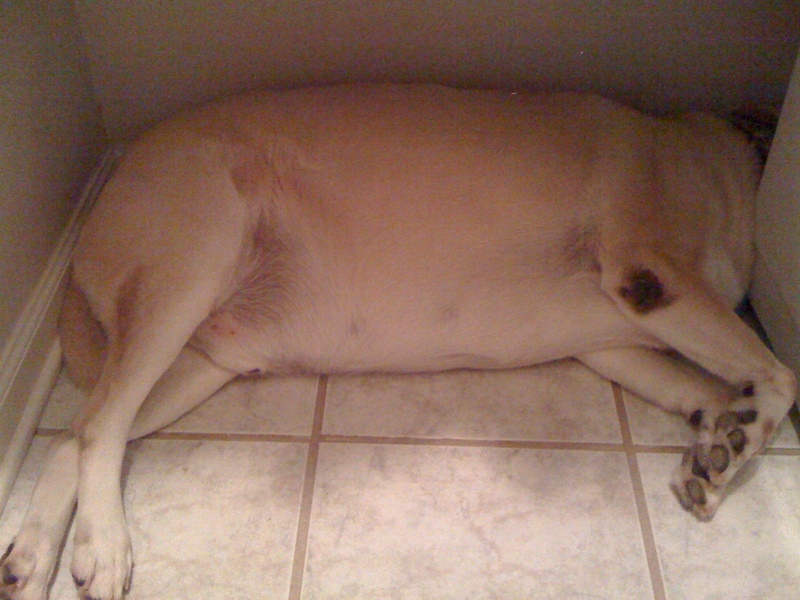 As we start off 2011 Sammy started to camp out at a spot by the front door and that would be his favorite place to be for some time. He also had a look on his face that was not his usual happy face. A thought kept returning to my mind and I had this dream where Sammy had to be sedated for an operation and did not wake up from it. This dream together with the sad face I started to worry there was something wrong with him and waited to see for additional changes in his behavior. Around March he started to limp, the doctor and I both thought it was arthritis because Sammy is a big dog and it was common to dogs of his size and weight. I gave him joint supplements to help and tried laser therapy. Both seems to help him walk around. Around the same time of starting to go to his happy place Sammy started to lick a particular part of his left front leg. I thought nothing of this at the time except it was their way of self grooming. Sammy’s arthritis got worse as the days went on. Around May/June of 2011 he stopped jumping up on my bed to sleep. He would need help getting up to bed but the couch was ok. The bed is a little higher off the floor. The night of June 11th I wanted Sammy on the bed with me and picked him up and placed him on the bed. Everything seems normal until a little after 2am. Sammy tried to get down and I woke up to him screaming and crying. This was the worst sound he has ever made and he cried for minutes, his picked up his front left leg and wouldn’t put pressure on it. I could not figure out how to comfort him except to hug him and pet him. I thought he sprained it while landing but it did not improve after a few days. 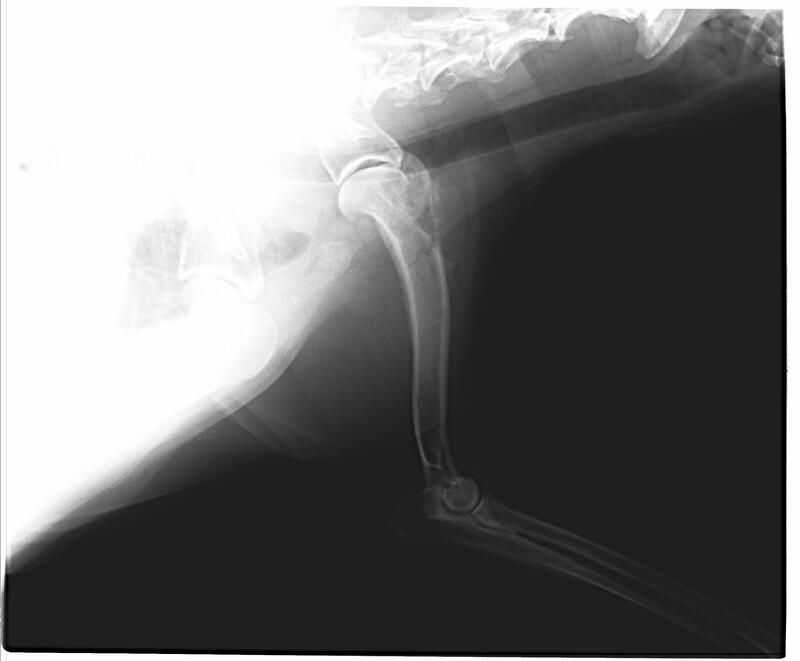 X-rays would show a fracture in the leg and signs of bone cancer have eaten away at the bones. I would go on to feel guilty about putting him on the bed that night for I have broken my buddy. I know his leg would be fractured eventually due to the cancer damage whether it be getting in or out of the car or walking but it still pains me to see him injured. I met with specialists and there was no repairing of the leg because the fracture was located where the cancer was and amputation was the only option. This was a most difficult decision, I remembered the dream and wondered if the amputation operation was the operation he would not wake up from. If I do nothing cancer will eat away more of the bone and spread to other parts of the body, the doctors estimated less than 4 to 6 months remaining at best. If we amputated the leg and no chemotherapy probably 6 months but if you are going to go through with the surgery then chemo is a must otherwise what is the point. 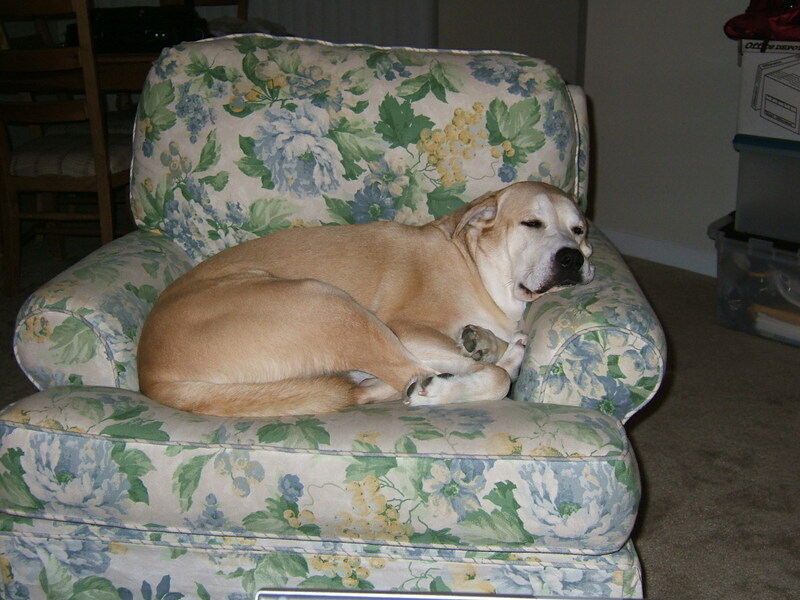 Sammy was 11 and I worried what would the operation do to him and if he would have trouble getting around, he was about 85 lbs at this point. 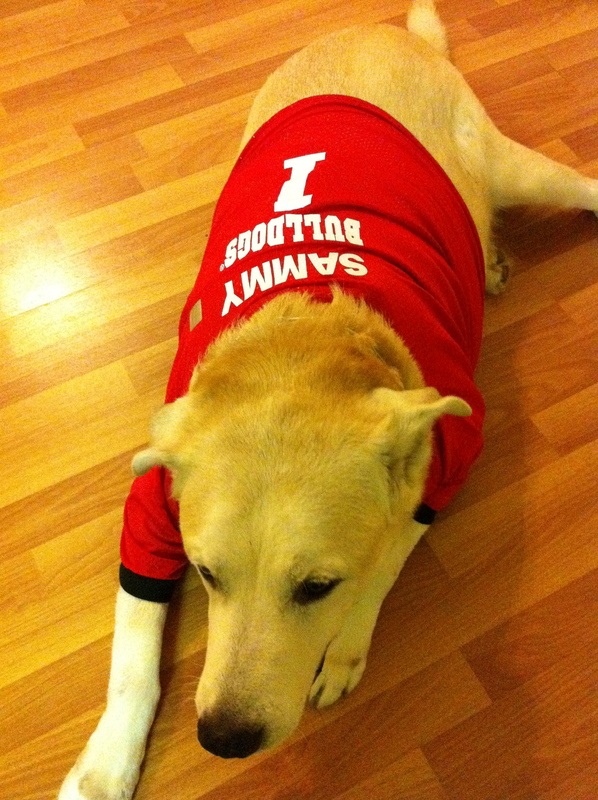 Sammy needed to lose at least 10 pounds to make mobility easier with his arthritis. Surgery together with chemo we are talking maybe another year as that is the average. Most dogs live more than 9 to 12 months after, some live upwards of more than 2 years. There are many factors and this was the hardest decision I have had to make. I debated back and forth for about a week. After much thinking I decided not to go through with the operation, I worried the dream would be true. Was not sure about putting Sammy through the trauma of losing a leg at such an old age. Also I wasn’t sure how he would move about with 3 legs and putting most of his weight on the back legs with a bad hip. Decision was made and my goal was to make his remaining days as comfortable as possible. Talked to my vet about pain meds to help ease the pain. But one day a coworker mentioned he had a friend who works as a vet tech at an animal hospital with a doctor who specializes in canine cancer. The friend suggested I talk to the doctor. I figure a third opinion couldn’t hurt, perhaps the doctor is aware of new treatment options or new cancer drugs that would help extend Sammy’s life or maybe some type of walking device I can attach to help him get around. Like a bionic leg for dogs. I made an appointment and we are looking at mid July by now. The doctor agrees that amputation without cancer was pointless. You need chemo to give the dog the best fighting chance for cancer is already in the blood and amputation was not going to get rid of the bad cells, it would just spread to other parts of the body and attack that part. Chemo would keep them from becoming active. After meeting with the doctor I was back to not knowing what to do. Part of me wanted to do everything to help extend his life but the operation was high risk for him. I had to think about the quality of life post operation. What would he be like with 3 legs and going thorough months and weeks of chemotherapy. At least with humans we are able to speak and tell how we are feeling. I wish Sammy could have talked to me and tell me what to do. There is also the question of how much time he had, Sammy is a mix and given the breeds he is I calculated the average life span to be 11-12 years which meant Sammy was reaching the top of the life expectancy. On the friday after the appointment I decided to not pursue the operation and let Sammy live out his remaining days in peace and on as much pain meds I can give him to make things comfortable. I gave myself a friday deadline so I would have the weekend to make peace with whatever I decided. I made it our usual Chinese takeout friday where the dogs and I went for a drive after work to pick up Chinese food. After dinner I made the decision and tried to come to peace with it over the weekend. Sammy got a lot of bear hugs and treats this weekend. Throughout this I prayed and prayed to God for a sign I was making the right decision. My greatest fear was making the wrong one and regretting it forever. Before bed each night since the injury I would pray for the answer to appear in a dream. I do not remember a sign and while it seemed like God was absent it didn’t feel He was missing from my life or this decision. I had a peace about it regardless of which option I needed to make. Sunday night, Sammy was laying on the floor in the living room while I was watching tv I looked at him and he had excitement in his face and was smiling at me. So once again I was back to being undecided. I started to think about his behavior this weekend. He would hop to the Japanese maple out in the background and lay under it to enjoy the nice summer weather we were having. He would hop with excitement to come in and I had to give him a chance. This weekend was different, he showed more energy than the last few weekends and his face told me what I needed to know. It was at this moment I changed my mind and decided we needed to go through with the operation and chemotherapy. I wanted to give him a fighting chance and no matter what happened he and I can say we fought a good fight but it wasn’t meant to be. The operation took place on July 9th. I was nervous the entire day, I wasn’t sure what time the operation was because the surgeon had appointments in the morning and it was a drop Sammy off in the morning and they will schedule it after morning appointments. I was asked to call at 1pm and they will update me. When I called they told me he was in the middle of surgery and the doctor will call me when it is done. I was very very nervous, I knew the risks and my dream. I got a call a little after 3pm telling me Sammy is out of surgery and is in recovery, they say the operation went fine. He is heavily medicated and the doctors gave him extra pain meds because it was a major operation and they didn’t want him to feel any pain. They didn’t know when he can come home because they wanted to make sure he is eating and drinking water first. But it would be ok for me to visit. You better believe I dropped whatever I was working on and got into my car to make the 30 minutes drive from office to the animal hospital. Seeing Sammy was a big sign of relief but it was also heart breaking. He was very much sedated, connect to an IV drip as well as a pain meds drip and two pain patches on his back. He was also wrapped like a mummy. He was awake but very sleepy. He looked at me and my heart tanked. He had a facial expression of ‘what did you do to me’. I am not sure he knows what happened due to the amount of drugs he was given but I know his face and it broke my heart. I sat down in the kennel he was resting in and pet him. I was afraid to touch him as I didn’t want to put pressure on the incissions. I want to hug him and take him home with me but I couldn’t. I also wanted to stay with him, the doctors probably wouldn’t like that. I told Sammy I would be back to bring him home soon and gave him a kiss on his nose. Sammy survived his first night after surgery. The following morning he was awake and ate baby food. Both were good signs according to the surgeon. It would be two more days before I could bring him home. He spent another night at the hospital as a precaution. Sammy got to come home on the 11th. He also had his first chemo before coming home with me. Seeing him try to walk on 3 legs was also heart breaking. He fell down a lot on his first day home and made me question my decision. His face was also not the same after the operation. The smile I had come to see for 11 years seemed to be missing. Sammy the week of the surgery still sporting the wrapping. Two days after being home and Sammy was doing better, he was back to eating the regular dog food and not baby food. He was also able to walk longer distance without falling. Most importantly, he wasn’t showing any symptoms from the chemo so that was all good news in my book. He was still wrapped tightly and in a few days would need to go back to have a checkup and a drain tube, bandaids, and pain patch removed. The doctors said removing the pain patches will help him regain his balance better. At this point I was just happy to have him back with me and I can give him hugs anytime I wanted. Two weeks after the surgery and Sammy was doing better. He was more alert and would looked at me when I called his name and was able to wag his tail and bark. But he was slow to eat his regular food dosage and lost 12 pounds since the day of the operation. The weight lost was too quick but in a way it was good as it will help him move about with 3 legs. I stopped one of the medications to see if that will help. It was also time for a checkup to see if he can have the second round of chemo but his white blood cell count was too low so we had to wait for it to return to normal. This meant he was likely to catch infections so he is on antibiotics. In 12 years I have never given Sammy so much medications, during his recovery he had 9 different meds and vitamins daily. It would take Sammy one to two months to adjust to being on three legs but there were times when he moved as fast as when he had four legs. In the beginning he would fall down as he tries to adjust to wood flooring or concrete flooring, the slippery surface made it difficult for him to push up so I tried getting him socks and even doggy boots. They helped but he did not like wearing those things and would often take them off by using his mouth. It was funny seeing him wear socks and boots. Sammy would go on a strict diet and was able to get to our healthy weight target of 70 lbs. I tried a lot of different brands to find one that would work the best and even tried a vet-only speciality which worked the fastest. It was such a joy to see Sammy hop and be so quick. Sometimes he would out run Leah although I don’t think Leah was trying to outrun him at the time. I would come to give him a nickname of ‘Speedy’. He was my speedy mutt. One activity I missed doing with Sammy is playing hide-n-seek. The house we live in has an open floorplan meaning the living room has an entrance to the kitchen and to the foyer and to the living room, sort of a circle. I would run into one room and Sammy would chase after me, I would run fast and often get out of sight of Sammy. The first couple of times we played this game Sammy didn’t know what was going on so I was able to sneak up to him but he soon figures out the route is a circle and he can stop and run the other way to see me. Well, what I would do is stop in the middle and hide behind a pillar in the living room. Sammy would freeze because he expected me to come out of an entrance, it often takes him about 10 seconds before he would turn around and come looking for me. Once I hear him move I would continue my route so I wouldn’t be in the room when Sammy enters to come look for me. I would often go hide in another room all together and wait for him to come find me. Sometimes I would giggle and give up my position. Every time he finds me I am amazed at how, if he followed scent or found of my fast beating heart. We stopped playing this game after his surgery. In all, Sammy would undergo 6 sessions of chemotherapy with the last one on Oct 23, 2012. The last two were extreme difficult for him, his immune system was so weak at this point and he picked up infections left and right. 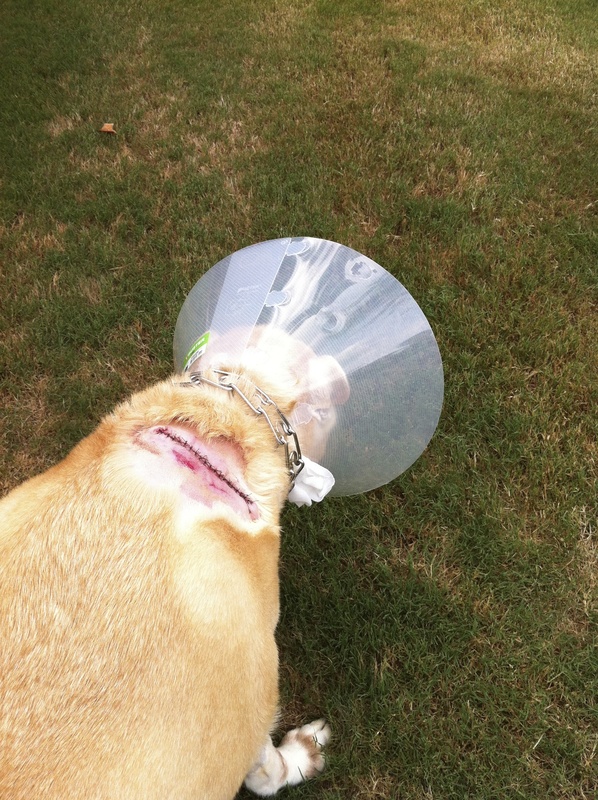 First it was an ear infection then skin infection and infections under his chin. Antibiotics along were not able to cure him and we needed a more powerful drug, interferon. It took us two dosage adjustments before we found the right amount to which it seemed to have a positive effect. Around Christmas/New Years it seems everything was under control and he would be healthy for the first time in years. Our 3 months checkup in January would not show visible signs of cancel and his blood count was normal. This was good sign and I was very happy. Saturdays in the fall is college football season and I enjoyed watching with Leah and Sammy Georgia Bulldogs play, Georgia is our school and we enjoyed cheering them on. Saturdays would be a big day for us, I would either cook a feast for myself and have treats for the dogs or it was Chinese takeout and treats for them. When Georgia scored they would get a treat and if we won the game, it meant that night was either a biscuit bone or rawhide or ice cream. There are too many times with me jumping in excitement and waking them from their rest. They would come running to me to find out what was happening or they would know it was treats time. 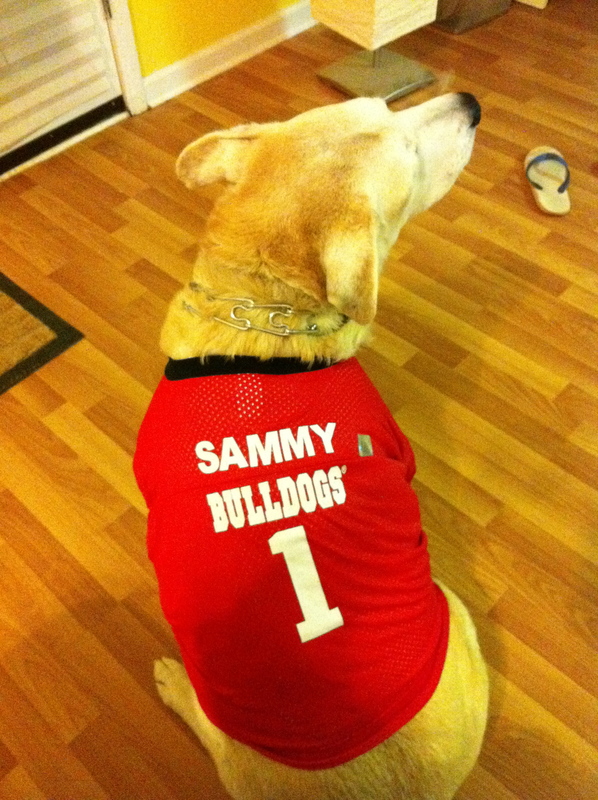 In Nov of 2011, I got Leah and Sammy doggy UGA football jersey with their name on the back. It would be one of the best gifts I have ever gotten for them. Sammy would come to wear it on game days and during office visits. I would have loved one more football season with him or one last bowl game to see him in his jersey. But seeing how the 2013 season played out as a disappointment I am a little glad Sammy’s last season was a good one even though we were 5 yards short of going to the BCS title game. The Capital One Bowl would prove to be an exciting win for us and it was a good day of celebrating the new year with him. He is forever a Georgia Bulldog wearing his jersey one last time on his last day with me. Sammy’s check up in January of 2013 was positive but his next would not be so good. In April 30th 2013 at his 6 months checkup chest x-rays would show a pea size growth in one of his lungs. Infections would also make a return. Back on antibiotics and interferon he was. Sammy was also having trouble moving about and the doctor said to put Sammy on bed rest. The doctor didn’t say where the bed had to be so I took a doggy bed to the office and took Sammy to the office so I can keep an eye on him during the day. This would be one of the last times he would accompany me to the office, hoping on stairs or the parking lot pavement would become too much for him as he grew weaker. 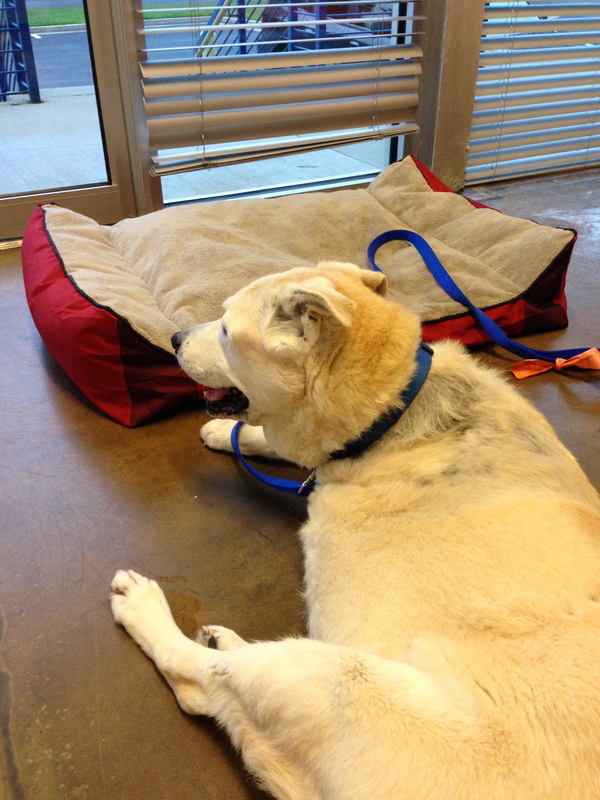 Sammy looking out of the office not resting on the doggy bed I got for him. The doctor suggested we return in a month to get another x-ray to determine growth rate. Sadly, Sammy would return sooner than anticipated. The week of May 17th Sammy started to have trouble walking or pushing himself up from the floor. On May 16th he would cry when trying and would stop being able to move around. I made a call to the specialist and was fortunate they were able to see him the following day. This would be the first time I have seen a stretcher for dogs although it looks just like for humans. They would put him on a stretcher and take him to be examined. X-rays and ultrasounds would show there was something pushing on his spine and surgery would be super risky due to the location. The growth in his lung also grew 50% in about a 3 weeks time frame. Due to the return of cancer in his lungs and location of the growth, radiation would not be possible. It was in front of his heart and radiation might cause the heart to stop. Chemo was an option but we now have to think about quality of life. The last round of chemo made him very tired and reduced the effectiveness of his immune system. Recovery would be unknown and they did not recommend surgery. There was only one option to which I was not ready to make on this day. I would take Sammy home along with medicines to help reduce the swelling. 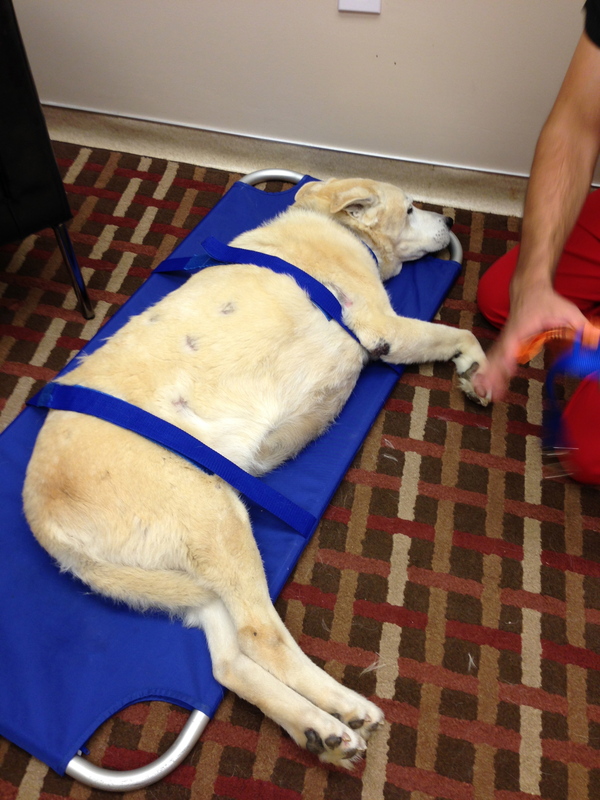 Sammy being lifted off for examination on a doggy stretcher. Sammy got a little better that weekend and the following week, he was able to move a little bit more and get himself off the ground but hop long distances were not possible. He spent more and more time underneath the Japanese maple tree in the back yard and it would become his favorite place to be. I would let him rest there for as long as he wanted, one evening after dinner he spent hours there until I went and picked him up before midnight. You can see it in his eyes, he felt very at ease near the tree and it is almost always the first place he hopped to after I opened the door. 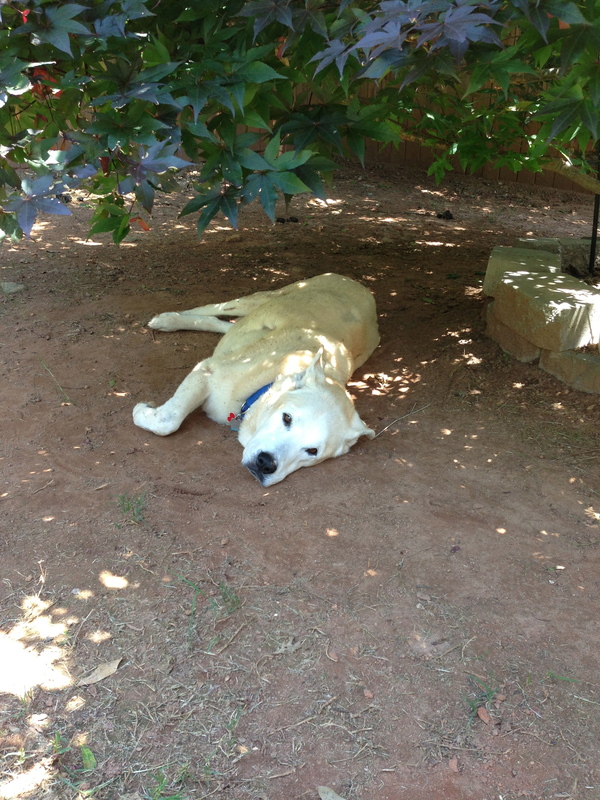 Sammy resting under a Japanse Maple tree I planted in 2007 in memory of Snoopy. Sammy would live 41 more days. He got a little better but his desire to eat slowly went away, he started to lose weight very quickly. 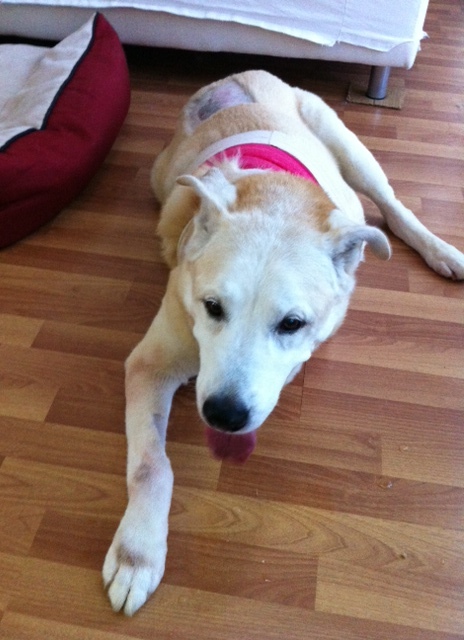 We tried medication after medication and nothing increased his appetite or helped with his mobility. I even tried mixing canned with dry food, at first it seemed to be working but after two days he stopped eating again. I tried different brands and flavors but nothing worked. His last weekend with me I grilled a flank steak, I don’t do it often but it was a favorite treat of his. On this particular sunday, he didn’t event want to look or smell at it. I would put it in front of him and he would turn his head. He would have difficulty going to the bathroom and would need help. I would hold a towel under him and help pick him up while he moves around and to go outside. He would often collapse while going to the bathroom. I bought bath wipes so I could clean him after each bathroom break. My heart was slowly being broken as I watched him grow weaker with each passing moment. Sammy was very determined at times, he would crawl when he wasn’t able to push himself up. It was the toughest to watch him try and I knew the time would be near. I tried giving Sammy treats but he had no desire for that as well. My vet told me Sammy would tell me when it was time and I kept talking to him and looking at him for signs. I didn’t see it but what I saw was his face looking at me even when he was too tired to do anything. I think he was holding on for me. I think Sammy would have let his body get so weak just to stay with me for another day. I too wanted him to hang on but he stopped eating and I know what will happen. The logical side of me had to take over from the emotional side. I had to think about what happens to a being without food. The last set of medication we can try did not work. I prayed and prayed and I hugged him every night before bed. When the medicine had no effect and he stopped having any interest in food or treats I knew it was time. As much as I wanted Sammy to be with me I knew it would be torture to him as he stopped eating and I couldn’t let him do that to himself. I can’t be selfish and watch him grow weaker and thinner. I had to do what was best for him and made the calls to arrange for his last day. My hands would shake while I dial the numbers and I used short sentences as talking brought tears to my eyes. Friday, June 28th would be that day. Sammy’s last week was full of love and comfort. I tried to make him as comfortable as he can be, I hugged him as much as I can. Every morning and night I prepared food for him in the hopes it would spark an appetite so I can cancel that appointment. I worked from home so I can be with him every possible moment. I kept telling myself it was the right thing to do and I can’t be selfish as it would only get more painful for him. Showers turned into conversations with God of things were not suppose to end like this. The only times I let my guard down was in the showers. Tears would combine with the water and flow down my face. I can understand age taking Sammy from me but not cancer. We can put a man on the moon yet cancer is one of many things for which we seem to be helpless against. There is never a good time for death and I wished the timing was different because work was super busy. The project I was involved in was behind schedule, we were not going to meet the deadline with all the features ready. I was working 80 hours a week helping to catch up and I wanted to spend every second with Sammy doing things on our bucket list. I wanted to go for drives with him through places we have been to, go to Starbucks drive-thru one more time, get McDonald breakfast one more time, show him the campus of UGA, drive to the beach. I think Leah knew what was happening. She has been keeping her distance from Sammy ever since he got ill. Every once in a while she would be near him but her face was one of sadness too. 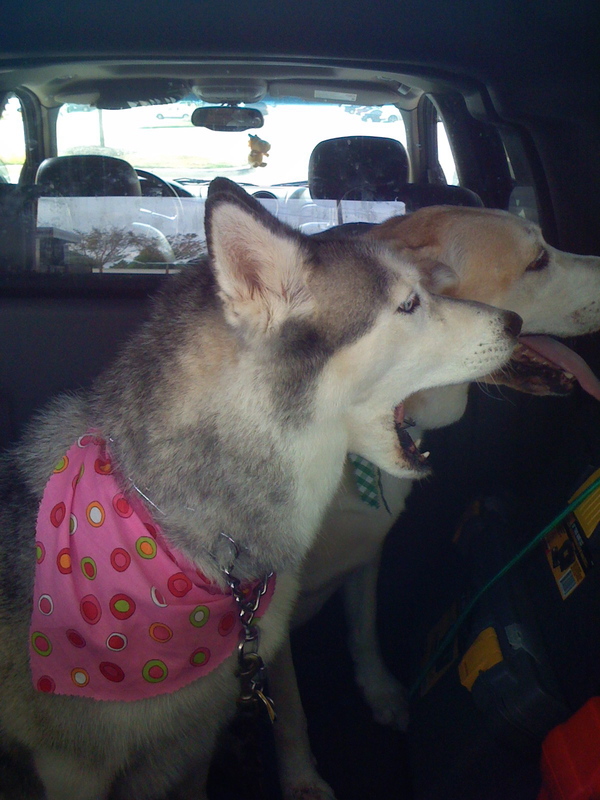 It was harder and harder to get both Leah and Sammy to howl or speak. What was once so easy to do became silence. Sammy was surrounded by his canine friends during the last week. I was looking after a friend’s dogs and they gave Sammy his bed and space while also showing him love. They would join him on the couch or the doggy bed. Sammy and Parker sitting on the couch, k-i-s-s-i-n-g.
June 28th is a day forever in my heart. I picked a friday because I wanted the weekend to grief and not have to think about work. I had a work conference call to take care in the morning and then I was to focus on Sammy. I avoided saying anything to him about what was to come, I hugged him all morning and told him I loved him and thanks for everything he has done for me during the last 12.5 years. I think the other dogs sensed something, one by one they would come to Sammy when I was next to him. I remember Leah coming up to Sammy and be nose to nose. She paused and then walked away. I like to think the dogs were saying good bye and giving him kisses. The appointment at my vet was at 10am. 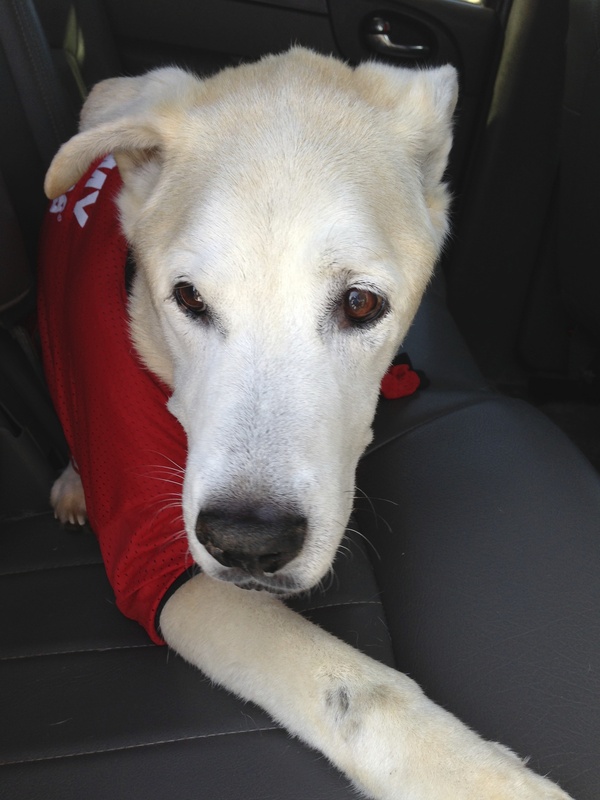 I dressed Sammy in his UGA jersey and picked him up to place him in the car. By now he would not be able to walk on his own or have the power to hold himself up. I decided to take the long drive to the vet’s office, our normal route is 2.2 miles but I decided to take a 3.9 miles route, this was one last drive for me to tell him how grateful I was for him being in my life and sorry we weren’t able to do everything I had wanted to do. The radio was turned off this day so I can talk with him. I wanted to drive slow and pause time but I also didn’t want to do anything that would jeopardize my chances of taking his ashes home with me on the same day. 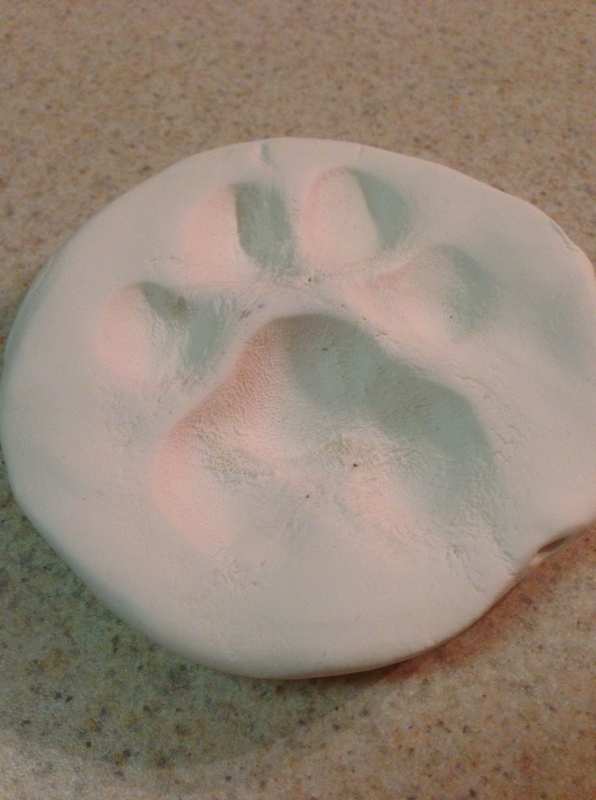 I decided to have Sammy cremated in order to spread his ashes are various places. Because it was a friday and the crematory wasn’t open on weekends I didn’t want to get there too late and not be able to have the ashes home with me by the end of day. Sammy and I arrived at the vet’s office, I spent a few minutes in the parking lot just to sneak in a few more kisses and hugs. I picked him up and a lady said to us ‘good luck with your dog’ as she was walking back to her car. Any words at this point would have brought me to tears but I managed to say ‘thank you but this is our last visit’. She offered her condolences and I made my way into the office with Sammy firmly in my arms. Everybody at the vet’s office loved Sammy, he and Leah did not fear the vet visits. They enjoyed the visits and were always so happy to go for the ride to get a check-up. Throughout the health issues they knew me and Sammy by our first names, I can call and say I am Sammy’s dad and they would know who I was even though I am sure there are other dogs with Sammy’s name. Knowing they loved Sammy as much as I did helped. Luckily the office was empty and I didn’t have to deal with other patients. They quickly got me into the exam room and it was prepared for the appointment. There was a towel on the examination table and paperwork ready. I placed Sammy on the towel and read through the paperwork, paid the bill so I didn’t have to do it afterwards. 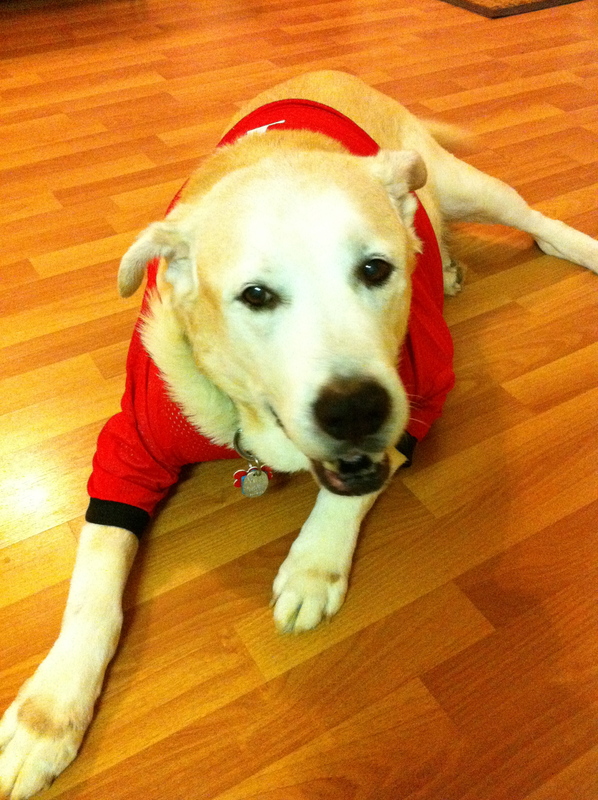 I had a few minutes alone with Sammy, I stroke his nose, his head, his ears, his stomach, and adjusted his jersey. He was very tired and just rested his head on the table. The doctor came in with two technicians and asked if I had any questions. I have gone through this moment with her many times as I was first struggling with what decision to make when Sammy fractured his leg. I knew what was to happen and wanted to postpone it as long as I can. I see the needles and drugs on the table next to Sammy. I was rubbing his stomach. The doctor asked me if I was ready, I gave Sammy one last kiss on his nose and said ‘yes’. The doctor said she was sorry Sammy and I was going through this and I said ‘thank you’. She shaved a spot on Sammy’s leg for the injection. Prepared the needles, picked up his right front leg, and injected the drugs. Sammy fell asleep one last time, it was very peaceful and did not take long at all. Seems like I blinked and it was all over. I am happy that Sammy is pain free now. I made the decision to transfer the pain from him to me and would do it all over again. The doctor listened to his heart and told me there was no heart beat. I stroked his head and tried to close his eyes but with dogs the eye lids do not close. This I did not know. It took all the energy I had to not cry and I knew if I spoke I would have tears so I kept quiet. They helped me load Sammy into my car for me to drive to the crematory. I wanted to take Sammy myself, didn’t want him to be in a stranger’s car and wanted to be with him all to the end. The doctor offered her condolences again and I thanked her for taking such good care of Sammy. She told me to be careful driving. This would be one of the last few photos of Sammy. I took it in the parking lot before I was to carry Sammy into the doctor’s office. Sammy was light having lost about 10 pounds in a little of a month. I would do the math in my head to help justify the date. How much weight he was losing per week and at his current weight, how much time do I have left. I know I made the right decision but part of me still needed convincing. It was tough to drive without tears and to look into the back seat and seeing Sammy resting there. I arrived early and was briefed on what was to take place. I caught them off guard because I arrived about an hour or so before my scheduled time. I explained to them I wanted to be there early so I can make sure to get back the ashes before they closed for the weekend. They understood and were friendly about everything. They placed Sammy in a room and I was given as much time as I needed to say goodbye. I gave Sammy a few more hugs and kisses and shed more tears. It would take about three tries to say my final goodbye. When I thought I was ready I would turn around and give more kisses, tell him how much I appreciated having him in my life. Sammy was cold to the touch, I looked into his eyes and saw darkness. This room had peppermint candy and I would take three, having the candy in my mouth helped me from having tears. At the crematory, as I was loading Sammy onto a cart there was some hair shavings on the towel Sammy was on. It was from the doctor’s office where they shaved a part of his leg for the needles. I placed the hair on the center console of my car thinking I would put it along with his collar. Without thinking I closed my door causing the hair to scattered. This caused a wave of emotion to come and I can’t believe I lost Sammy’s hair even though I had already stored some the morning of before leaving home. I would be angry at myself for forgetting hair was there and extremely tearful over the loss of the hair. At home in a plastic bag was hair I cut from him for save keeping but I thought this hair was different, it was from his last moments and was more special. I searched everywhere for it but couldn’t find it, to this day I like to think part of Sammy is in the car with me and will be forever going on rides with me. The circle has been completed. What started 12 and a half years ago was now over. I still remember the day when Sammy entered my world and now I have his ashes in my hand. Later in the day the operator returned Sammy’s ashes to me and told me about the animal’s prayer he read before starting the process. He asked me if I wanted him to read it to me and I said ‘no’ because there was no way I would be able to not cry. Later that night I read it and cried. As I walked back to my car I hugged the box the ashes are in and cried as I walked back to my car and kissed it. I read dogs would cry if they lost a fellow dog friend and wondered how Leah would act. She was distant and at times would walk from room to room as if searching for Sammy. She also made sounds the following saturday and sunday to which I have never heard her make. And I think it was her crying from what I read about dogs crying and the sound or motion they make. I tried to comfort her as best as I can, gave her hugs and rub her belly. After that first weekend without Sammy I have not heard the noise again. The week following would bring tears each time I saw the bookshelf where his ashes were resting. There is also a picture of him in a frame. Each night before bed I would come to tell him good night just like the hundreds of days before. I would stop saying his name around Leah, I suspected hearing his name and not seeing him was making her depress. Sammy was a great dog, very friendly with people. Despite his large size I have this joke where if someone tried to break into my house, Sammy would kiss that person instead of being a guard dog. My parents were not dog people but my dad met Sammy one weekend during a visit and he came to like my dogs. When we would talk he would frequently ask how they are doing. First thing Sammy would do when he meets someone new is try to shake their hand. He did this with my dad, my sister and brother-in-law during their initial visits. I am glad Sammy got to see the person I have become. I like the 2013 version of me much better than the 2000 version. I can honestly say I am a better person today because he was in my life. Sammy, my husky mutt has changed the dog breeds I like. Because he was a mutt, so smart and full of characteristics from a bunch of breeds I am open to the idea of me caring for another mixed breed. I used to only want huskies but because of Sammy’s close appearance with a yellow lab I too now also like that breed. Buddy, a golden retriever I adopted to replace Sammy is due to Sammy’s influence. He opened my eyes to the possibility of other breeds other than siberian huskies. Caring for Sammy opened my heart to want to give senior dogs a good home to retire. This is why I picked Buddy, a 9 years old retriever when I adopted him. I figured I have room in my heart to give a senior dog a nice retirement home even though I know I will have to say goodbye in the near future. Leah is 14 and Buddy is 10, I know the time to heal in between good byes will be short but it doesn’t matter. My goal is to give them the best retirement I can possibly give. I am even considering adopting a Greater Swiss Mountain Dog because this breed had a big influence in forming his personality and I want to get to know the gentle giant this breed is known for and to see a piece of Sammy. 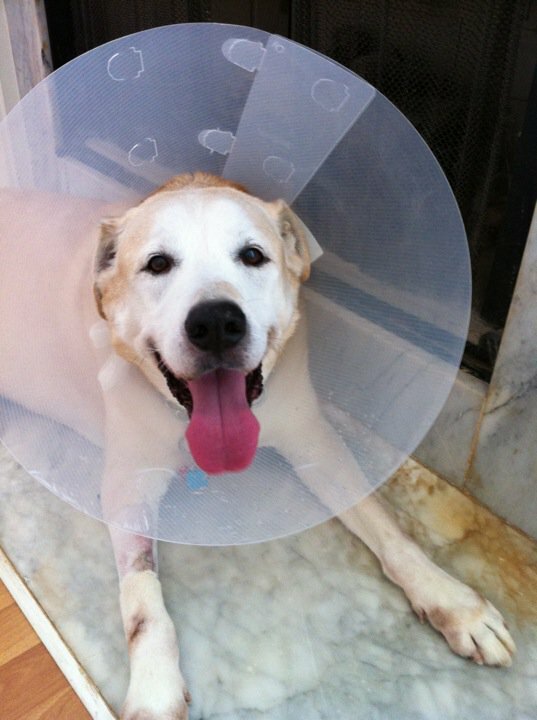 The experience of caring for Sammy also made me wish there was better research into canine cancer. I now have a list of things I want to do should I become rich, like Richie Rich rich. I will solve cancer once and for all. Some day I hope to have a pet sanctuary where dogs with health issues or special needs can go or just go to get a second chance at being a dog. I want a place with a pool where dogs can go swim. Not a day will go by where I don’t think about the events and wonder if there was something I could have done different, I know signs were missed and I wasn’t always the best dad to him. I do wonder if things would have played out differently had I done a few things differently or catch cancer earlier. There will also be times when I will regret not doing enough with Sammy and Leah. Such will be the regrets I will carry for the rest of my days. One of the many things I will miss about Sammy is how he loved to rest in the laundry room with his head between the dryer and the wall. I don’t remember when he started this or what brought it on but it is one of the things that brought him comfort during rains or thunderstorms. Although there were non storm nights where he would sleep in the laundry room just like this. and for all that must be put to death. so to share the blessings of the merciful. What started out as a mistake and an accident 12 years ago became one of the best things to happen in my life. Sammy will forever be in my heart. I choose not to mourn for Sammy because Sammy is all right, pain free and playing in God’s dog park with Snoopy. My world is a little less bright because of the loss of his physical presence. I may not see him again for some time but he will forever be in my heart and in my actions. I don’t remember why I have this rule, it may be because there was a time I wanted to be private about changing jobs to keep a certain former employer from being nosey rosie. Granted I don’t live that exciting of a life, they most likely did not care and this was just all in my head. This rule is now about respecting the former employer and myself. To give each party the time to heal any wounds and to make peace with the separation. I have always felt work is like a relationship, as long as the employment is beneficial to both parties it is ok to continue the relationship but once it no longer benefits a party it is wise to move on. With a few exceptions this has been the case during my career. If you are my guest, you are not allowed to do the dishes. Regardless of who prepared dinner. Granted if I am a guest in your home you can bet I am going to do the dishes even if I made dinner. These steps assume the user has already setup PhoneGap 1.0, Xcode 4 and has configured it correct to build and run a sample app on the iPhone stimulator. For detailed instructions, visit Phone’s Getting Started with Xcode guide. 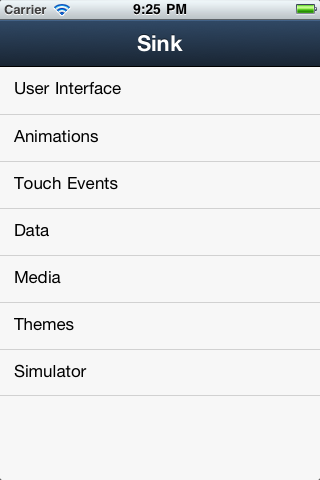 Create a new PhoneGap project in Xcode, call it SenchaTouch_KitchenSink. In the Project Info section, change iOS Deployment Target to 4.2. In the Target Summary section, change Devices to Universal and Deployment Target to 4.2. Perform a Build to make sure it compiles and Run to install to iPhone or iPad Simulator. Add the PhoneGap’s www folder to the Project. Copy the Sencha Touch Kitchen Sink example code to the www folder. Copy sencha-touch-1.1.0/senchatouch.js and sencha-touch-1.1.0/examples/autotheme.js to the www folder, same folder as phonegap.js. Copy resources/css/sencha-touch.css to the resources/css/ of the PhoneGap’s www folder. Adjust path in index.js for senchatouch.js and auto theme.js to reflect the files are now in the same root folder as index.html. Edit the index.html in the root www folder to include the css and js for the Kitchen Sink demo. Edit the SenchaTouch_KitchenSink-Info.plist file and make sure ‘Supported interface orientations’ have the same options as ‘Supported interface orientations (iPad)’. This will allow the app to handle rotations. Perform a Build to make sure it compiles and Run to install to iPhone or iPad Simulator. If all goes well, the Kitchen Sink application should appear on your Simulator. Copy resources/img/phone_startup.png from the www folder to the Resouces/splash folder of the Xcode project and rename the file to Default.png. Copy resources/img/icon.png from the www folder to the Resources/icons folder of the Xcode project and rename to icon-72.png. Take the file icon-72.png and make a 57×57 version of the image and save it as icon.png. You can download my xCode source at my GitHub repository. This rule is pretty simple and I have seen so many drivers do it. In a parking lot, I can’t drive through parking spaces to get across the lot. I have to drive in the designated driving lanes and not across parking spots. This rule is more, it is just dangerous because people don’t pay attention and you never know what may happen if you cut across the lot. I would like to travel to China, walk the Great Wall of China or go see the pandas or the Terracotta Army. But I have a rule of not travel to countries whose government is communism. Maybe it is after watching Locked Up Abroad but I worry about doing something that might be considered a crime in a country whose legal system is questionable. A while back there was this American kid in Singapore who got in trouble for chewing gum. It is not like I am going to travel to communist countries to commit crimes but I would rather not go to jail for something that might be considered a non-issue back home. Better safe than sorry because I am too pretty for jail.